During the early 1900’s Snow directed the editing of a publication called The Silver Standard. With text and pictures, he contrasted events of the year 1847 with events of the year of his periodical’s publication. Berkshire Crumb Knife (Crumber) on the same page with the Fish Knife (Fish Slice) for easy comparison. 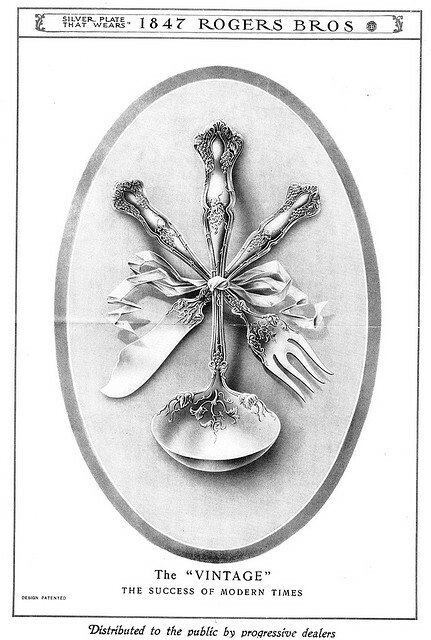 Columbia Salad Spoon and Salad Fork (Salad Serving Set). 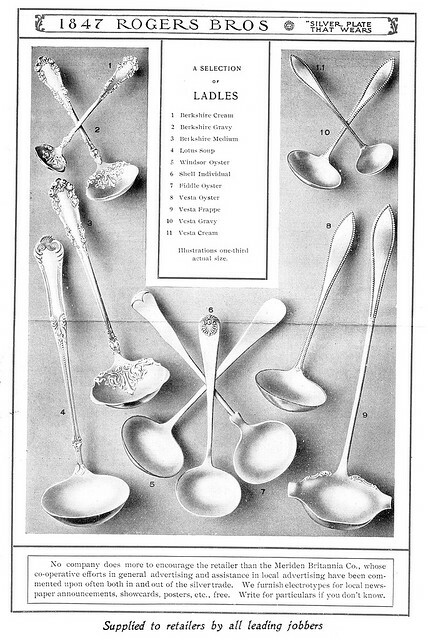 Five different sizes of Avon ladles, from the Cream Ladle to the Punch Ladle. Fruit Knives with three different blade styles. A Vintage grape Chocolate Set (Chocolate Muddler and six Chocolate Spoons). A Charter Oak Soup Ladle with detailed bowl decoration you can almost touch. 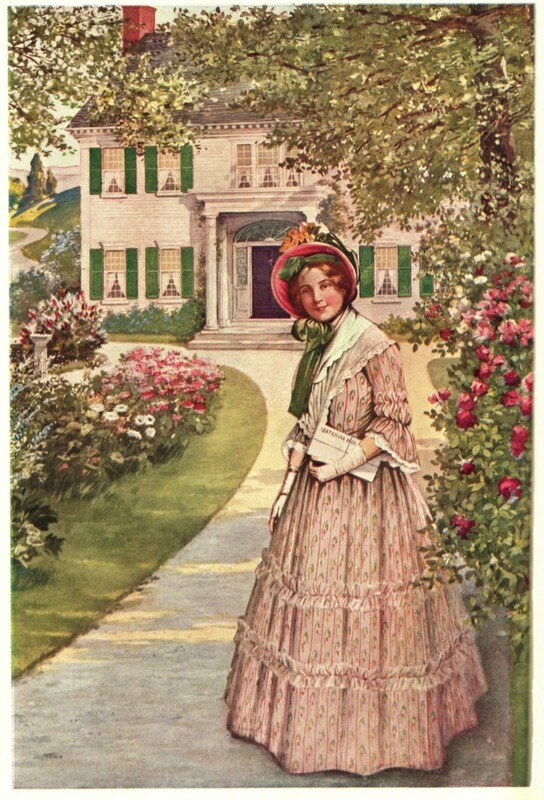 The 1847 Girl in many poses, in color (cover), as well as in black and white. Here are some selections from the 1907, 1910 and 1915 issues of The Silver Standard. 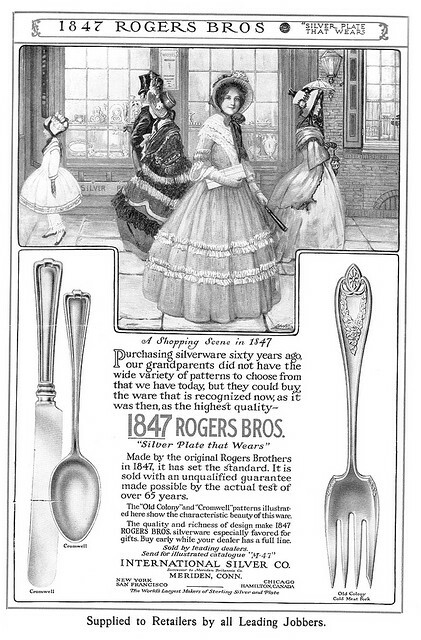 In addition,there are many images of The 1847 Girl, the demure but attractive female symbol of International’s quality and tie to the past through the original Rogers brothers. Click on my Flicker Set to see the images. They can be enlarged or downloaded. Please do not use them for commercial purposes. I was pleased to see your website. I have a Berkshire 1897 Medium, punch ladle, silver plated.I show on the above add as number “3”. If you are interested I do have pictures I am selling it.